Resistor. Super detailed resistors and capacitors oh my! How can you resist? Impress any nerdy guy or girl: computer scientist, programmer, electrician, engineer or maker. Is dad, grandpa, boyfriend or husband a tinkerer with solder and blinky things? Perfect for groomsmen and brides boys of the geeky persuasion. Nerd power! Circuit board necktie "Resistor" - Olive with gold ink, narrow. 100% Polyester microfiber necktie. 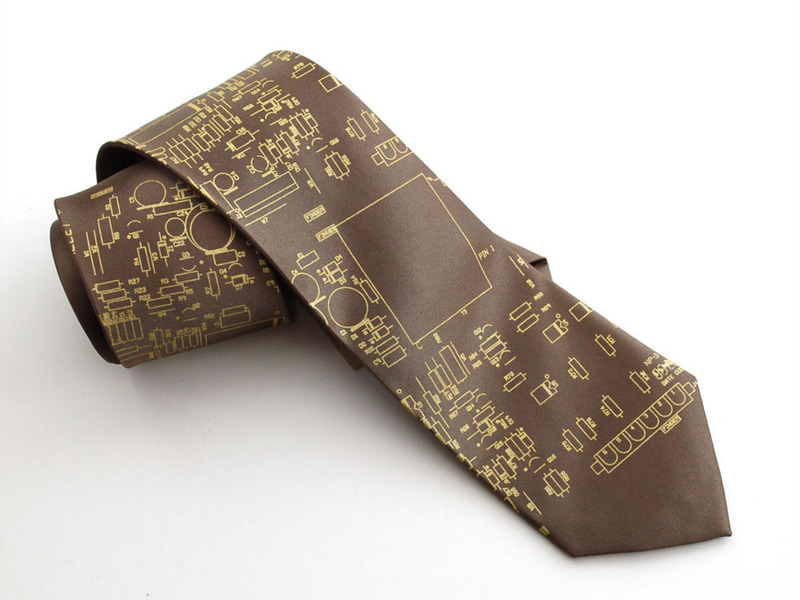 We're excited to print a limited run of ties printed from vintage circuit board patterns. This is the 7th in the series from Bethany "Toybreaker" Shorb, CEO of Cyberoptix, no circuit bored here. (ha!). 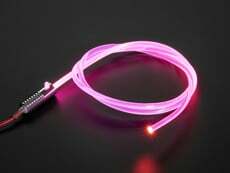 We have covered Behtany's amazing work on Adafruit for years, so we wanted to start carrying her designs. They go perfect with the iCufflinks! This print extends very high up on the tie, approx. 18" (46 cm) from the bottom point; perfect to be seen from under a vest or jacket. It appears these were for appliance controls (particularly ovens and cook-tops) in the late-80's. When fabricating actual circuit boards, silkscreens are used to print etch-resistant inks on to the board to protect the copper foil. Subsequent etching removes the unwanted copper and one is left with the desired copper pattern for conductivity. LIMITED EDITION! As is the nature of vintage screens, once these screens die, that's it. The tie is made of a soft microfiber, having almost the same hand as real silk and is printed with high-quality, non-toxic, water-based ink. The tie is available in narrow, 58" long. All new materials! For reference, narrow is 2.75-3" wide at it's widest point. Cyberoptix only prints with high-quality water-based inks. They’re invaluable for the health of their shop, the environment, and they perform much better on delicate fabrics. Water-based inks have a much softer hand on fine fabrics and will never crack over time as Plastisol inks (the industry-standard for large-run shops). Not to worry, our water-based inks are as or more durable than harmful solvent-based inks. Microfiber is Vegan-safe and our most common finish – why not exclusively silk? Many who choose not to consume animal products for ethical, dietary and religious reasons are concerned about the silk industry and wear nothing derived from living things. In the interest of not being exclusionary, they have decided to carry ties in synthetic microfiber. As dry cleaning is not always an option, this makes the synthetic finish far easier and more practical. Want to learn more behind the process of making their vintage circuit board ties? See the video interview/studio visit with Make Magazine! This print extends very high up on the tie, approx. 18" (46 cm) from the bottom point; perfect to be seen from under a vest or jacket. The tie is made of a soft microfiber, having almost the same hand as real silk and is printed with high-quality, non-toxic, water-based ink. The tie is available in narrow, 58" long. All new materials! For reference, narrow is 2.75-3" wide at it's widest point. Learn how to tie a tie @ http://www.tie-a-tie.net/. Got a better resource? Let us know!